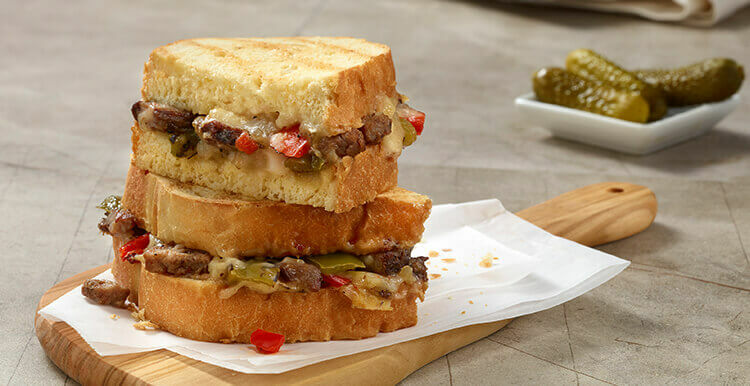 Tender beef strips with peppers and onions in a cheesy sauce piled up on Sourdough bread crisped to perfection. Ingredients: BREAD (ENRICHED UNBLEACHED WHEAT FLOUR [FLOUR, MALTED BARLEY FLOUR, NIACIN, REDUCED IRON, THIAMIN MONONITRATE, RIBOFLAVIN, FOLIC ACID], WATER, PEA PROTEIN, NATURAL FLAVOR, OAT FIBER, VITAL WHEAT GLUTEN, AND 2% OR LESS OF SOYBEAN OIL, SUGAR, SALT, DOUGH CONDITIONERS [ENRICHED WHEAT FLOUR (WHEAT FLOUR, NIACIN, FERROUS SULFATE, THIAMIN MONONITRATE, RIBOFLAVIN, FOLIC ACID), CORN SYRUP SOLIDS, SODIUM STEAROYL LACTYLATE, MONOGLYCERIDES, SODIUM ALGINATE AND 2% OR LESS OF XANTHAN GUM, ENZYMES, HYDRATED MONOGLYCERIDES, DATEM, DEXTROSE, ASCORBIC ACID, L-CYSTEINE, AZODICARBONAMIDE, SOY LECITHIN], YEAST), SAUCE (WATER, CHEESE SAUCE MIX [WHEY, MALTODEXTRIN, DRIED CHEDDAR CHEESE (MILK, CHEESE CULTURE, SALT, ENZYMES), SWEET CREAM SOLIDS, POTASSIUM CHLORIDE, DRIED SOYBEAN OIL, DRIED BUTTER, RESISTANT MALTODEXTRIN, AND 2% OR LESS OF SODIUM PHOSPHATE, NONFAT MILK, CORN SYRUP SOLIDS, SODIUM CASEINATE, MONO AND DIGLYCERIDES], MODIFIED CORNSTARCH, AND 2% OR LESS OF SOYBEAN OIL, METHYLCELLULOSE, DRIED ONION, NATURAL FLAVOR [YEAST EXTRACT, NATURAL FLAVOR, BEEF FAT], SALT SUBSTITUTE [SODIUM CHLORIDE, POTASSIUM CHLORIDE, SODIUM GLUCONATE], LACTIC ACID, SPICE), BEEF STRIPS (BEEF, WATER, LESS THAN 2% OF MODIFIED FOOD STARCH, SALT, NATURAL FLAVORS, VINEGAR, DEXTROSE, SODIUM PHOSPHATE, ONION, PAPRIKA, CARAMEL COLOR, SPICE), REDUCED FAT PROVOLONE CHEESE (PART SKIM MILK, CULTURES, SALT, ENZYMES, SMOKE FLAVORING), FIRE ROASTED GREEN PEPPERS, ONIONS, RED BELL PEPPERS, AND 2% OR LESS OF CARAMEL COLOR, SEASONING (SPICES, DRIED ONION AND GARLIC, DRIED TOMATO, CHIPOTLE PEPPER, MALTODEXTRIN, JALAPENO PEPPER, NATURAL SMOKE FLAVOR). Nutrients: BREAD (ENRICHED UNBLEACHED WHEAT FLOUR [FLOUR, MALTED BARLEY FLOUR, NIACIN, REDUCED IRON, THIAMIN MONONITRATE, RIBOFLAVIN, FOLIC ACID], WATER, PEA PROTEIN, NATURAL FLAVOR, OAT FIBER, VITAL WHEAT GLUTEN, AND 2% OR LESS OF SOYBEAN OIL, SUGAR, SALT, DOUGH CONDITIONERS [ENRICHED WHEAT FLOUR (WHEAT FLOUR, NIACIN, FERROUS SULFATE, THIAMIN MONONITRATE, RIBOFLAVIN, FOLIC ACID), CORN SYRUP SOLIDS, SODIUM STEAROYL LACTYLATE, MONOGLYCERIDES, SODIUM ALGINATE AND 2% OR LESS OF XANTHAN GUM, ENZYMES, HYDRATED MONOGLYCERIDES, DATEM, DEXTROSE, ASCORBIC ACID, L-CYSTEINE, AZODICARBONAMIDE, SOY LECITHIN], YEAST), SAUCE (WATER, CHEESE SAUCE MIX [WHEY, MALTODEXTRIN, DRIED CHEDDAR CHEESE (MILK, CHEESE CULTURE, SALT, ENZYMES), SWEET CREAM SOLIDS, POTASSIUM CHLORIDE, DRIED SOYBEAN OIL, DRIED BUTTER, RESISTANT MALTODEXTRIN, AND 2% OR LESS OF SODIUM PHOSPHATE, NONFAT MILK, CORN SYRUP SOLIDS, SODIUM CASEINATE, MONO AND DIGLYCERIDES], MODIFIED CORNSTARCH, AND 2% OR LESS OF SOYBEAN OIL, METHYLCELLULOSE, DRIED ONION, NATURAL FLAVOR [YEAST EXTRACT, NATURAL FLAVOR, BEEF FAT], SALT SUBSTITUTE [SODIUM CHLORIDE, POTASSIUM CHLORIDE, SODIUM GLUCONATE], LACTIC ACID, SPICE), BEEF STRIPS (BEEF, WATER, LESS THAN 2% OF MODIFIED FOOD STARCH, SALT, NATURAL FLAVORS, VINEGAR, DEXTROSE, SODIUM PHOSPHATE, ONION, PAPRIKA, CARAMEL COLOR, SPICE), REDUCED FAT PROVOLONE CHEESE (PART SKIM MILK, CULTURES, SALT, ENZYMES, SMOKE FLAVORING), FIRE ROASTED GREEN PEPPERS, ONIONS, RED BELL PEPPERS, AND 2% OR LESS OF CARAMEL COLOR, SEASONING (SPICES, DRIED ONION AND GARLIC, DRIED TOMATO, CHIPOTLE PEPPER, MALTODEXTRIN, JALAPENO PEPPER, NATURAL SMOKE FLAVOR).